Edwin Warfield of Howard County starts The Daily Record on Oct. 2, the price is 2 cents, with offices at 124 E. Fayette St. Among the lawyers’ names on the Court of Appeals docket in the first issue: William L. Marbury Sr. and Richard M. Venable. 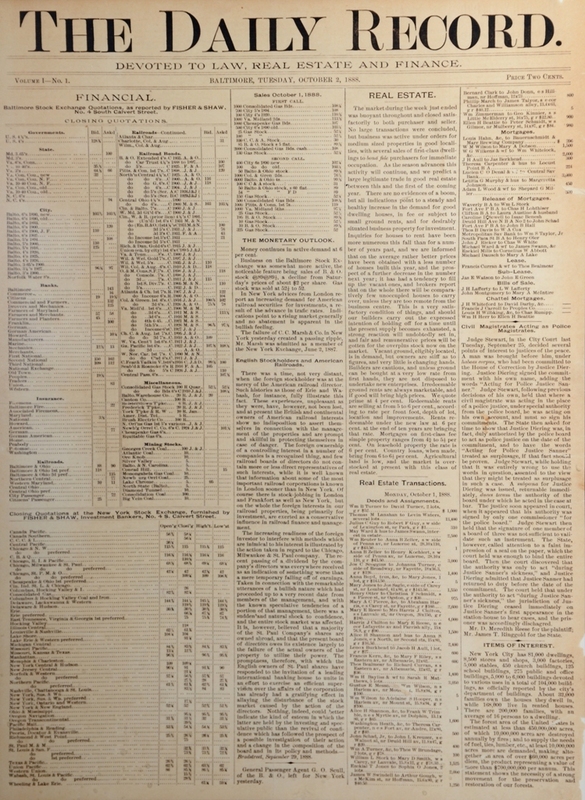 Because of other business interests and political ambitions, Edwin Warfield quickly relinquishes hands-on control of the paper to his brother, John. Warfield runs for governor on the Democratic ticket and is elected. Serves until 1908. 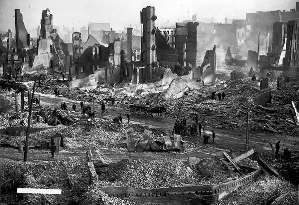 The Great Fire of Baltimore is on Feb. 7. The paper’s offices are reduced to ashes. It rents temporary space at 321 St. Paul Street and continues to publish without missing an edition. John Warfield, Edwin’s brother, succeeds him as president of The Daily Record. St. Paul Street building sold to city, which razes it to widen the street. Newspaper moves to four-story rowhouse at 15 E. Saratoga, where it will remain for nearly 100 years. Edwin Warfield Sr. dies, leaving an estate worth more than three quarters of a million. 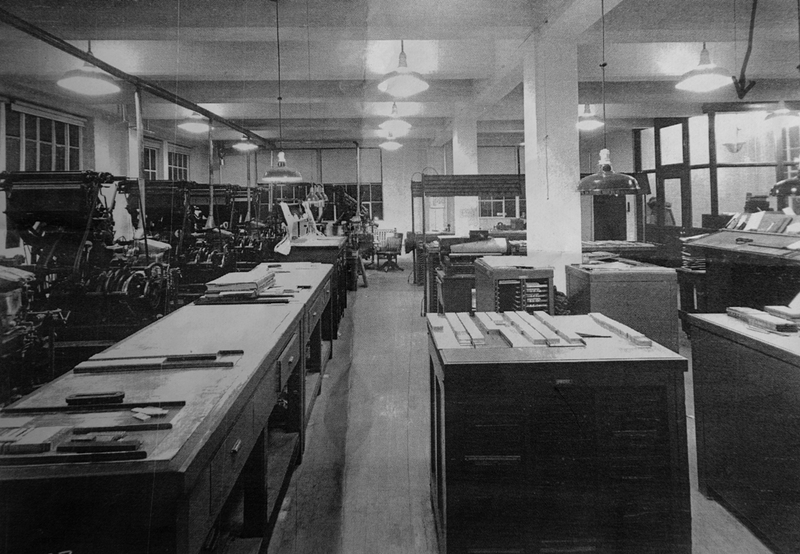 Edwin Jr. succeeds John as president of The Daily Record. Salary: $2,500. Paper is now a broadsheet. The Daily Record buys its next-door neighbor at 11 E. Saratoga Street to expand its office and printing space. 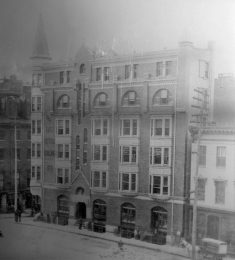 Façade is by Henry A. Knott & Co. 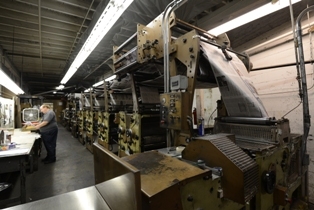 Circulation reaches 2,300 daily, 70 percent delivered by carrier. Sixty percent of subscribers are lawyers. Company has 32 full-time and 5 part-time employees. Office space expands again with construction of three-story addition at rear. 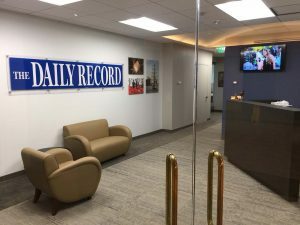 After years of printing legal and other records with limited news coverage, The Daily Record adds a summary of national and international news, plus syndicated court coverage and articles on insurance. Realty transactions take up almost an entire page. Frederick D. Godman starts working for The Daily Record as a part-time newspaper carrier. 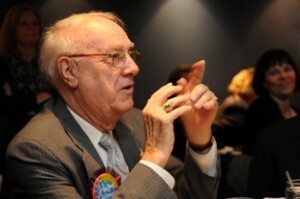 With time out for military service, he will work for the paper until his retirement as senior vice president in 2012. Edwin Warfield Jr. dies. One day later, Edwin Warfield III, a World War II veteran who had set his heart on a military career, walks into the offices of The Daily Record, sits in his father’s chair, and takes over the running of the company. Frank T. Wallace helps Warfield find his feet and is rewarded with the post of president of the company – the first non-Warfield to hold it, until his death in 1955. Edwin Warfield III elected to the House of Delegates from Howard County. 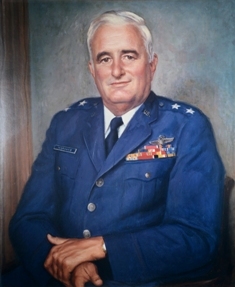 Warfield appointed adjutant general of Maryland, in charge of the state’s National Guard, a post he holds until his retirement in 1979. Edwin Warfield IV joins company. By 1988, paper changes from one primarily devoted to legal notices to one with a mix of staff-written news articles, local columns and cultural reviews. Some features, such as short capsules on personnel moves, are recognizable today. Circulation: 3,800. 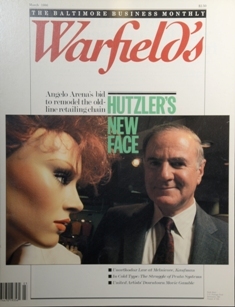 Company launches Warfield’s, a glossy magazine with an emphasis on business coverage. 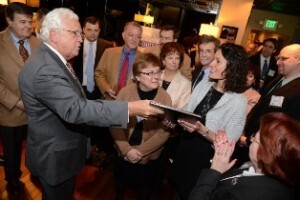 Eleven years later it merges with The Daily Record, forging a platform for substantial business coverage in Maryland. Presses move from Saratoga Street to 1414 Key Highway. The Daily Record begins publishing once again as a tabloid. Supplements and special publications proliferate, on everything from health care to construction. The Daily Record begins publishing Maryland Family Law Monthly. Dolan Media Co. (now The Dolan Company), future owner of The Daily Record, is formed by Jim Dolan in Minneapolis. 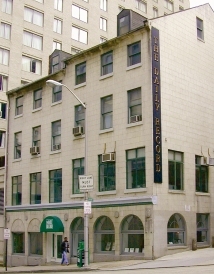 Warfield family sells The Daily Record to Dolan Media, ending 106 years of family ownership. Dolan names Richard H. Groves publisher. 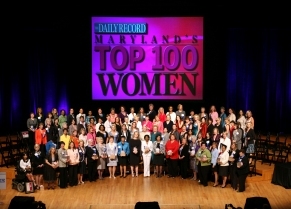 The Daily Record starts Maryland’s Top 100 Women, a publication and event honoring the achievements of influential women in Maryland. Christopher A. Eddings takes over as publisher, emphasizing the news side of the business, bringing color to the news pages and modernizing the presses. The Daily Record launches its first website. Maryland’s Top 100 Women moves to the Meyerhoff Symphony Hall as event attendance grows to nearly 1,000. The event has been held there ever since. The Baltimore County edition of The Daily Record debuts. It will later merge with The Daily Record. Leadership in Law awards event begins. 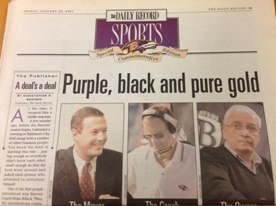 In honor of the Ravens’ appearance in Super Bowl XXXV, The Daily Record runs its first-ever sports section. Innovator of the Year awards event begins. 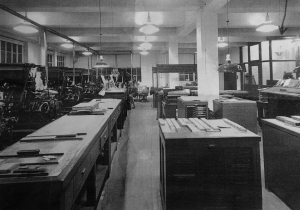 The Daily Record celebrates its 115th anniversary at The Baltimore Museum of Industry. Edwin Warfield III is named to the Maryland-Delaware-D.C. Press Association’s Hall of Fame. The Daily Record sends out its first email news blast. The company will later send out emails for breaking news as well as newsletters targeting real estate professionals and lawyers. 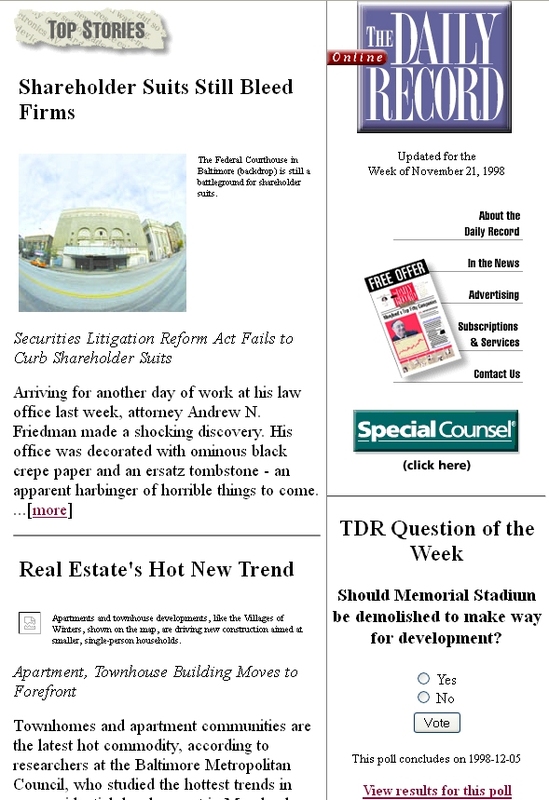 The Daily Record launches Maryland Lawyer, a weekly section for lawyers in the state. 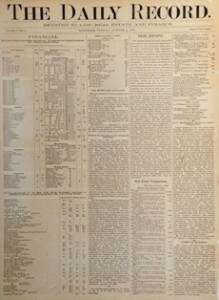 It will merge with The Daily Record in 2013. Influential Marylanders awards event begins. The Daily Record wins a National Newspaper Association award as the best newspaper of its size in the nation. VIP List awards begin. This event honors those successful before 40 years of age. 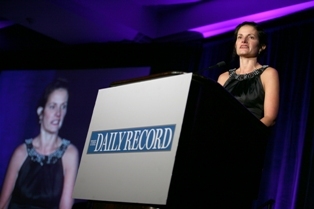 Suzanne E. Fischer-Huettner is named The Daily Record’s first female publisher. The announcement is made during the first Leading Women awards, which honor women 40 years of age or younger who have already made outstanding contributions in their fields. Maryland’s Most Admired CEOs awards begin. 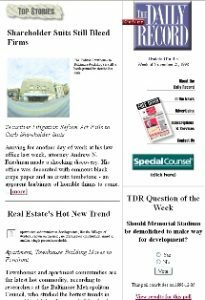 The Daily Record launches InfoPoint, a searchable database for new incorporations, construction bids, contracts and real estate transactions. Maryland Senate President Thomas V. Mike Miller Jr. presents The Daily Record with a proclamation to honor its rich, 125-year history of providing business and legal news to Maryland. In honor of its 125th anniversary, Daily Record employees pledge to perform a total of 125 hours of community service. By October, they had performed 220 hours of community service. The Daily Record launches Maryland Family Law Update, a monthly magazine about family law in Maryland. The product added original reporting and other writing to legal reference material that was part of the product’s previous version, Maryland Family Law Monthly. At the 20th anniversary Top 100 Women awards event, Publisher Suzanne Fischer-Huettner announces The Daily Record’s plan for a new women-focused magazine to be launched later in the year. Later, the company begins publishing Path to Excellence: A Woman’s Guide to Business. New Media Investment Group Inc., parent of GateHouse Media LLC, purchases The Dolan Company, parent of The Daily Record, to become GateHouse’s B2B media arm. Pittsford, N.Y.-based GateHouse Media publishes 620 community and business publications, including 125 daily newspapers, across the country. 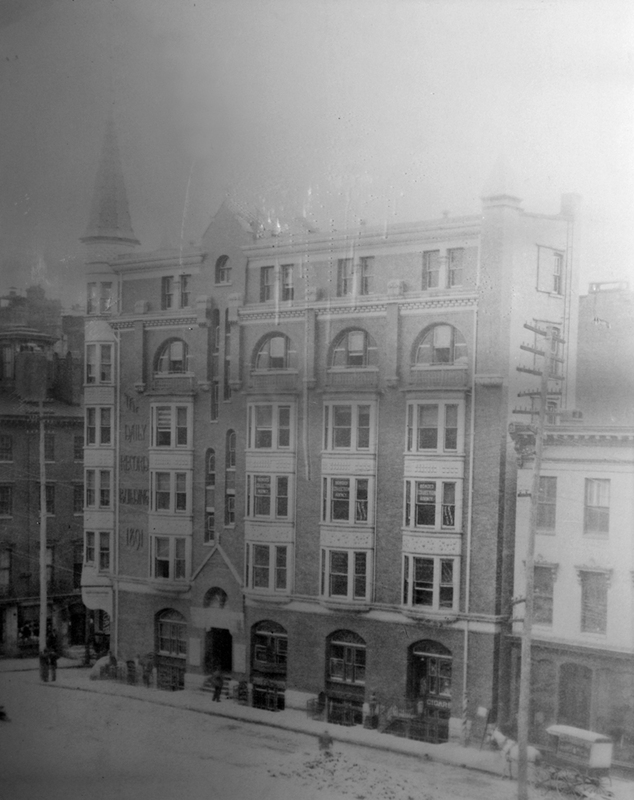 The Daily Record’s new office space at St. Paul Plaza in Baltimore. The Daily Record moves to new, modern offices inside St. Paul Plaza in downtown Baltimore. The location is around the corner from the former Daily Record building. The Dolan Company is rebranded as BridgeTower Media, which incorporates all of the local legal, construction, business and political titles within Dolan as well as the business journals, magazines, research and video units of Journal Multimedia, which GateHouse acquired in May. Reader Rankings and ICON Honors awards begin.